Endless squeeing for new gems. Those gems are fun! I figured Steven would encounter friendly gems on Homeworld, but I figured they'd be a splinter group of Crystal Gems. If they fought, but they've had eons of experience running and hiding because who can stand against the full might of Homeworld? None of them are soldier gems anyway, so fighting probably never even occurred to them. More rogue fusions on Homeworld! There are some smug fans right now I'm sure. (Not myself, been 50/50 on that prediction.) Also, Homeworld! We finally see it after all this time. I'm wondering about the giant White Diamond-esque silhouette. Maybe next episode...? P.S. It's always fun to do a Google image search after a new gem is introduced on this show. So far, just the actual gems. If history is any guide, that will change soon. Something else I realized: I'm pretty sure Rhodonite is part Pearl, based on the frilly shoulders, smooth gem, and Sardonyx-like waist arms. She said her Morganite replaced her. So maybe Morganite's pearl was having a dalliance with another gem, or someone under a Morganite was doing something untoward with their own Pearl. Here's hoping Rhodonite meets Pearl. 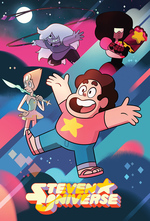 I'd like to see the CGs travel to meet the odd-colors and figure out a way to take advantage of the diamonds thinking Steven is still on homeworld and the new secret path between homeworld and earth. Yay new gems! I love that Padparadscha is so sincere, like a Slowpoke. I wonder if we'll find out about the gems that make up Florite. I loved the Henson-esque character design for florite. Even that connection added an extra layer to her character.